NOTE: The first 6 photos in this recipe are the best size of pork to be used. 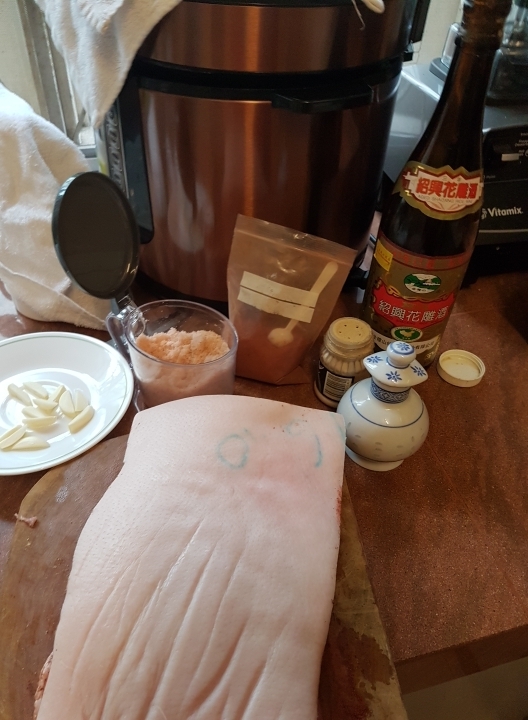 I added these photos to show the marinating process. 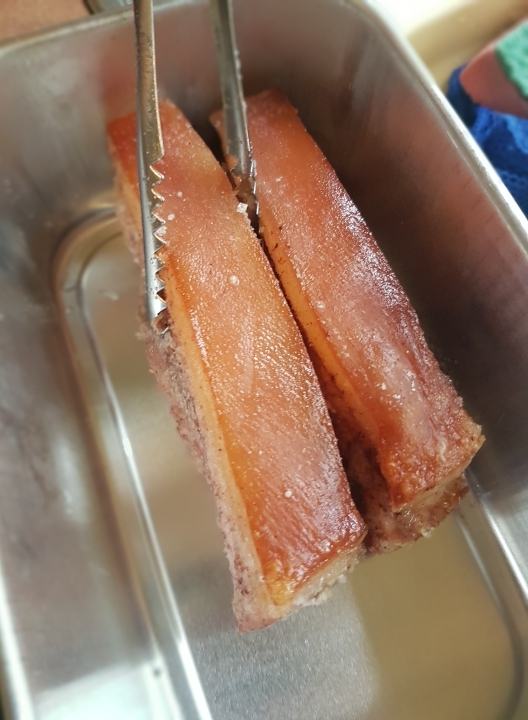 PLEASE DO NOT CUT THE PORK INTO STRIPS AS IT IS BETTER COOKED WHOLE. 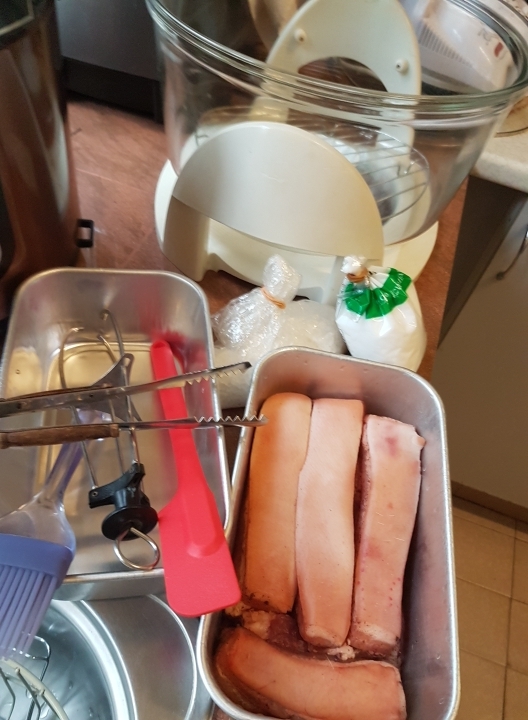 The 7th photo is what I actually cooked on the day I took the photo and what was available at the butcher was just the pork strips, so I had to place them together in a pan. RECIPE CREDITS: This recipe was created by our friend, Ervinn Siew’s aunt, Mrs. Fairly Yee, who has an entire book of her favourite recipes published but circulated privately. I do not have that book. In Kuala Lumpur, most people talk about getting it from a butcher in Taman Tun Dr Ismail market. I have never been there but have tasted siew yok made from his meat. I feel that the one I get from Daily Choize at 21 Jalan Radin Bagus 5, Sri Petaling, 57000 Kuala Lumpur; Pearl Pork (珍珠肉) is better. This is supposedly free from beta agonist and antibiotics. Both of us think like that there is absolutely no boar taint after cooking. This is also a lot more tender although you pay the price for it. 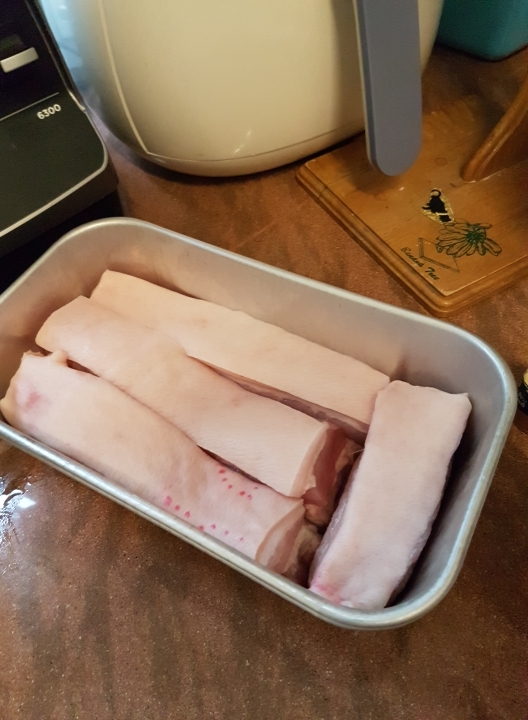 So I normally buy one or two pieces of pork, marinate it immediately upon arriving home, then place them into a zip lock bag and throw them into the freezer. That way I can have roast pork anytime I fancy. I have had frozen meat left in the freezer for up to 3 months without any issues. e) Garlic – cut into long strips. You will need a minimum of 8 strips. Photo 1 shows the cut garlic strips. c) Tray stand and tray handle. iii) Turn the meat around (skin facing down) and scour 2 lines about 1/3 and 2/3 of the width. Do not scour right up till the end – you can see the lines clearly in photo 3 below. iv) Rub salt, five spice powder, pepper, soy sauce, and chinese wine over the meat. Try not to get any of the ingredients especially the five spice powder onto the skin. 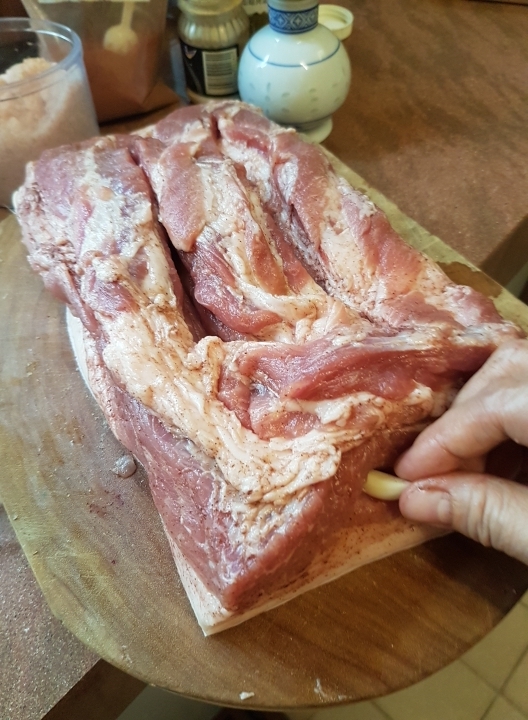 Best way is to place ingredients onto the palm of your hand and rub onto the meat a bit at a time. This also ensures even marinating. Go easy on the salt and five spice powder. How much you use really depends on your taste. 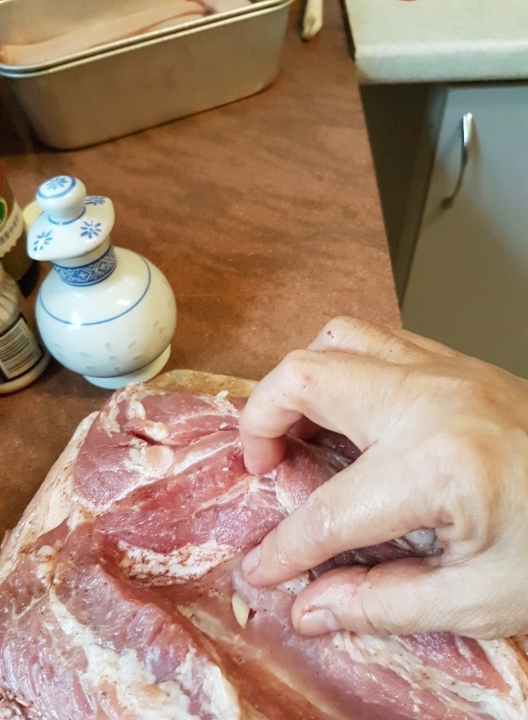 v) With a paring knife, make a hole at sides of the meat and push in 1 slice of garlic. Repeat around the meat. Minimum should be 2 holes per side. For a big piece of meat, I also insert into the scoured areas. Refer to Photos 3 and 4. Some people ask why not just marinate the entire meat with chopped garlic instead. Well, I figure that the garlic will then be burnt. 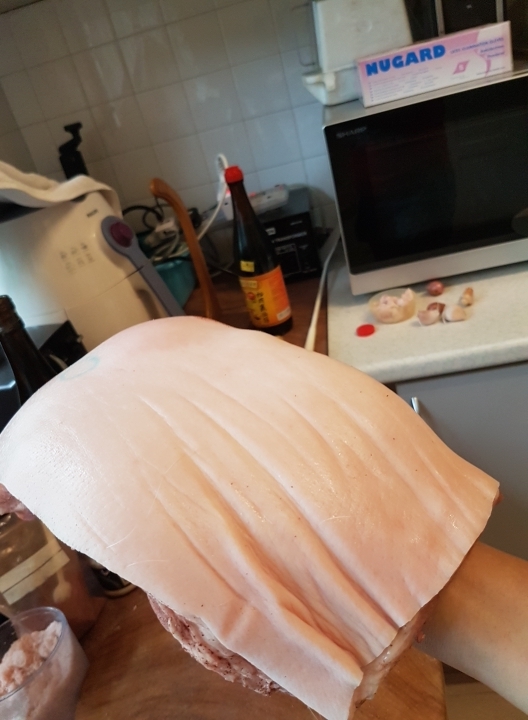 vi) Once done, wash hands, then hold meat up with the skin facing up, use a kitchen paper towel to wipe clean and dry. Then place into a zip lock bag and you can leave it in the freezer till you are ready to cook. If you are cooking the following day, just leave it in the fridge. Remove from plastic bag and leave UNCOVERED in the fridge for a minimum of 2 hours and a maximum of 5 hours. This is to help dry up the skin. Be careful not to leave it for too long as the skin may be over dried (Fridge burn). Remove from fridge at least an hour before cooking so that the meat is at room temperature. Please note that this photo below (Photo 7) is a DIFFERENT PIECE OF MEAT FROM PHOTO 6 – This was purchased in strips as the shop did not have a block of pork. 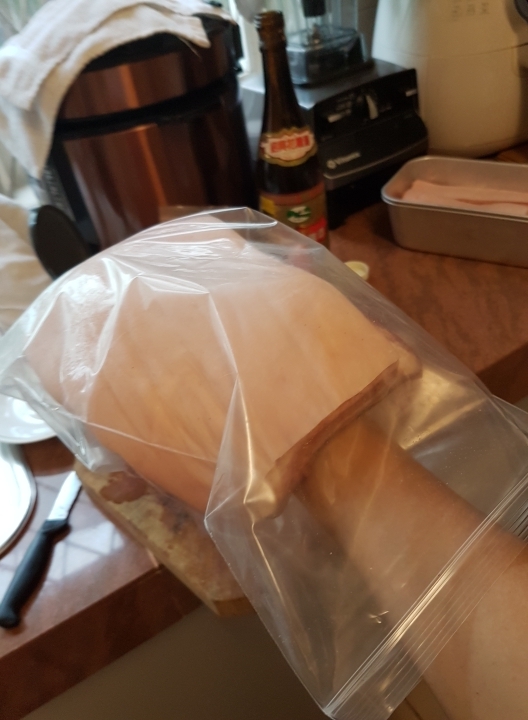 This is not the best way to cook roast pork but I tried and it still works. If you have a block of meat, DO NOT cut into strips for roasting. ii) Use fine salt to cover over the skin. 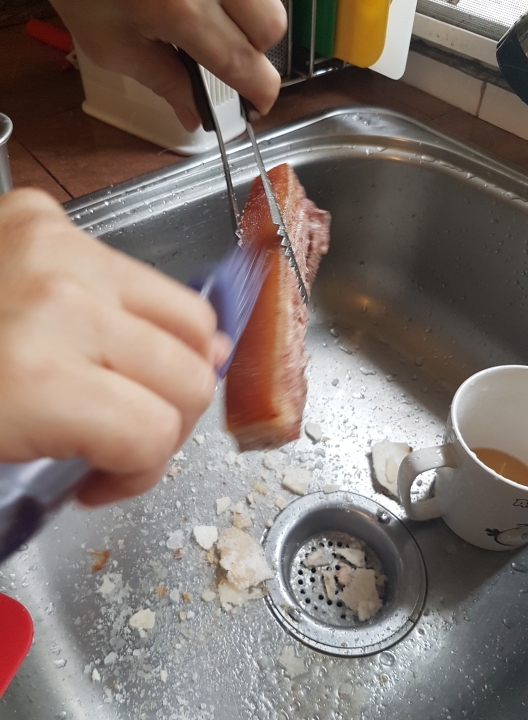 If you are worried about the salt falling to the sides, use a spatula to help as a “wall” beside the meat. 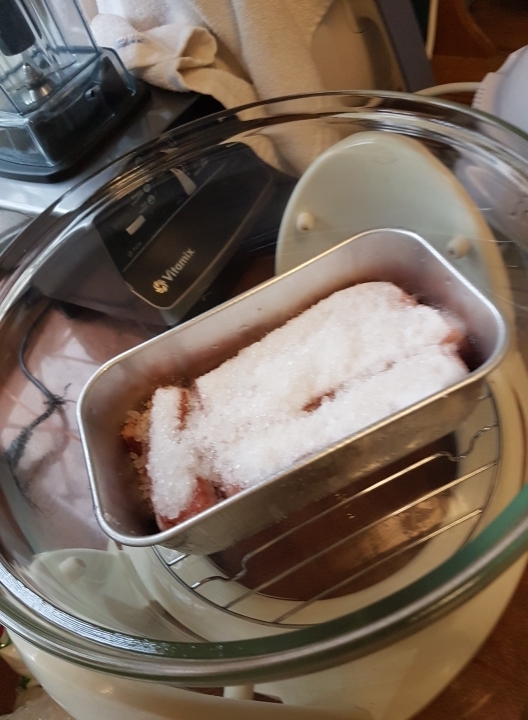 Then pat down the fine salt to compact it and add more salt so that it is a thicker layer. This is to protect the skin from cooking too early. Refer to Photo 9.
iii) After you are satisfied that every part of the skin is adequately covered, use some coarse salt on top. This is to prevent the fine salt from “flying off” when the oven is on. Almost all ovens come with fan assist now and it can blow off the fine salt. Refer to Photo 10. Photo 7 – Place the strips of meat as near to each other as possible and do not allow any part of the meat to be exposed. 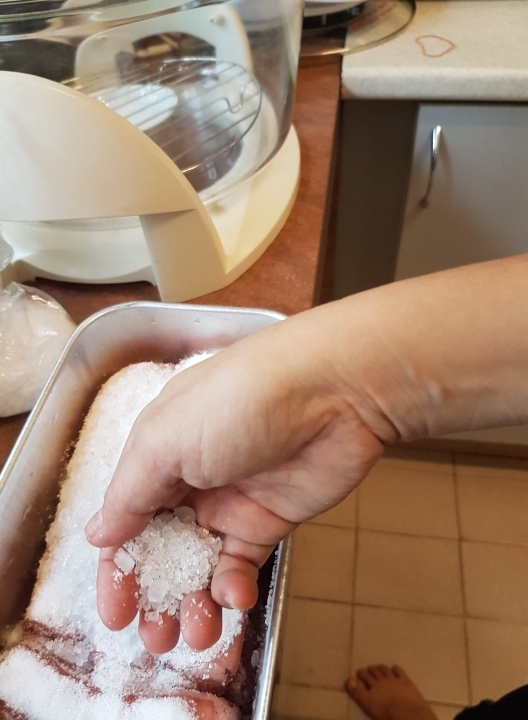 Photo 10 – Use coarse salt as a “weight” to cover over the fine salt so that the fan in the oven will not blow off that layer of salt. 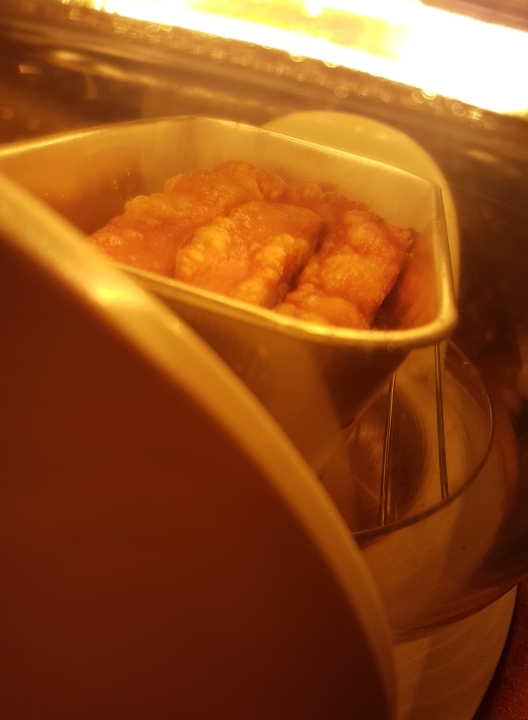 iv) Put a small sauce plate of water under the tray stand. This is to keep the meat moist while cooking. v) Carefully place the meat inside the oven, taking pains to ensure it is centralised for even cooking. vi) Cook at 1 hour at 170 – 175C. For bigger pieces of meat that has a lot of fat, I would add another 5 – 8 mins which means the temperature should be 170C instead. 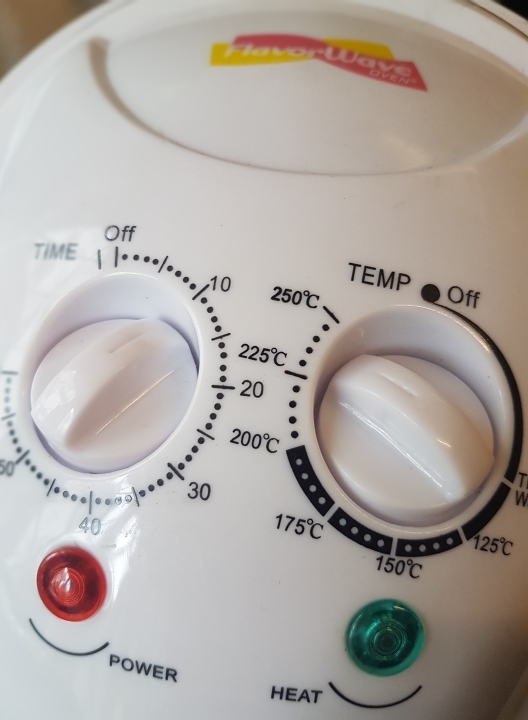 Do not be tempted to increase the heat for a shorter time. The idea is to slow cook it so that the fats will “melt in your mouth”. 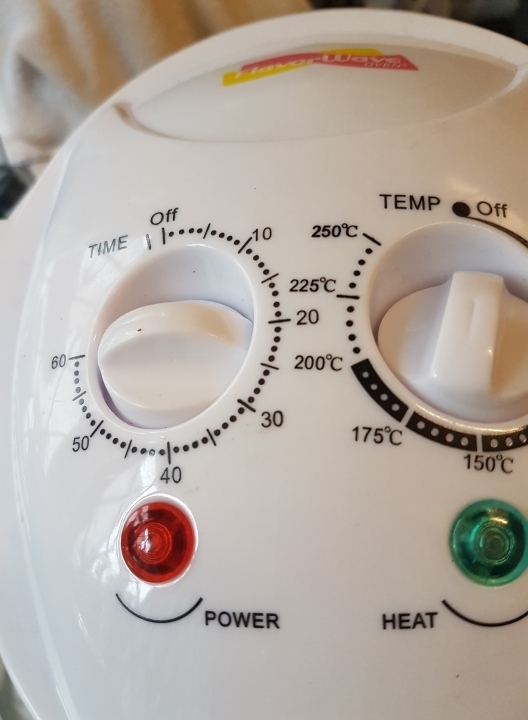 Note that if your meat is not at room temperature, or if it is a smaller or thinner piece of meat, or if you are using a different oven, you will probably get different results. The timer has a maximum of 1 hour, so if I need to add time, I normally add it back to a full hour after 10 mins to make sure I don’t forget. vii) Remove from the oven when the timer goes off. 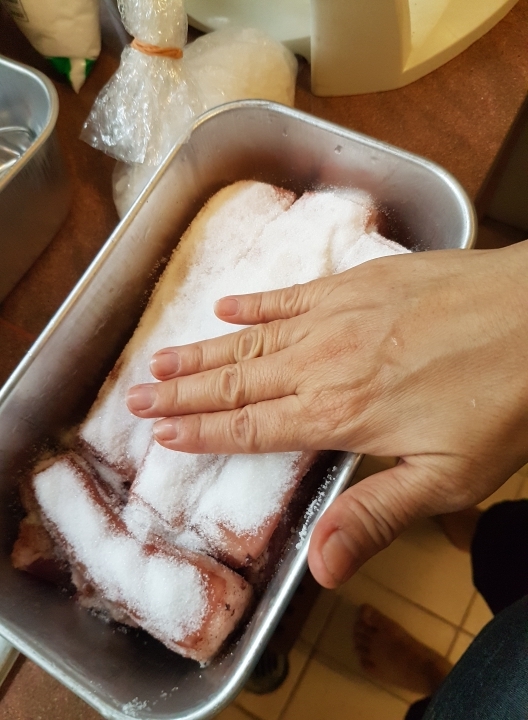 Remove the salt from the meat carefully so that it doesn’t “stick” onto the meat or you will get a VERY salty piece of roast pork. 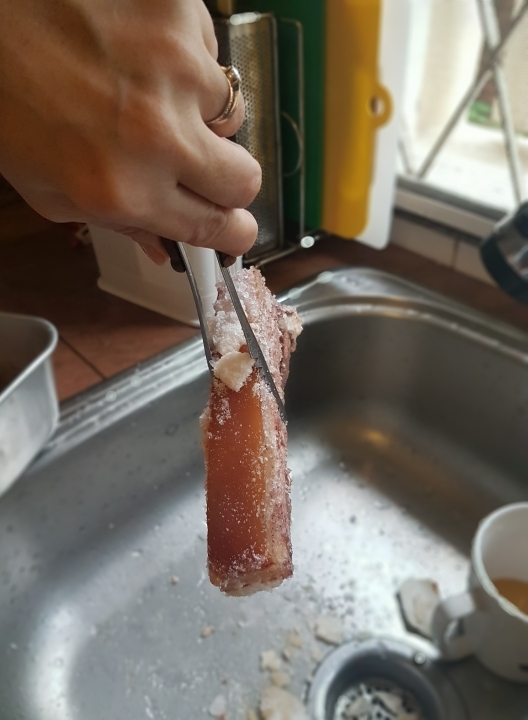 If you do not want to use the excess lard from this first cooking, just remove the bigger pieces of salt and then just brush off the remnants. viv) Place back into the oven carefully and again, ensure the meat is centralised. 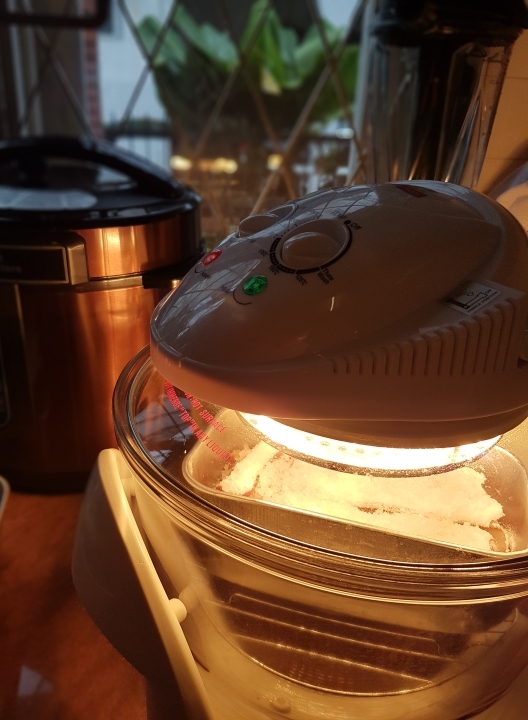 Temperature will be at a maximum of 250C. Set the timer to 10 mins but keep watch. Adjust the meat the moment you notice a pooling of oil on the skin because of unevenness. Keep readjusting the position of the tray if necessary. 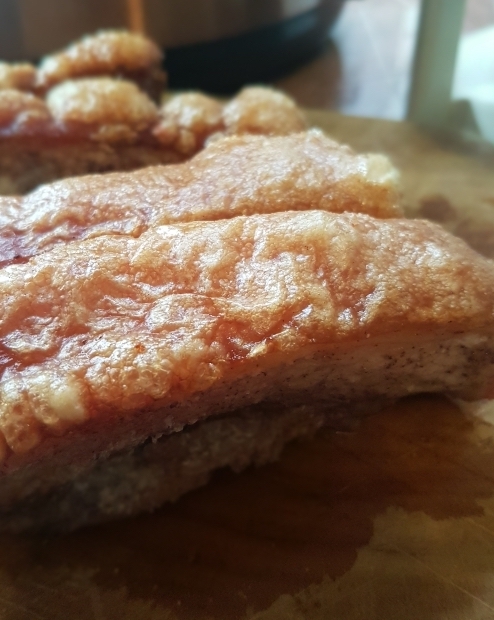 If the crackling is even and completely done, remove immediately from the oven and leave to cool down on some kitchen paper towel to absorb excess oil. I suggest you do not cook for more than 15 mins for this part even if not all the skin has crackled. Prolonged grilling will cause the crackle to be too hard. You can see from Photo 19 that this particular piece had some parts right in the centre that did not crackle but it’s better to have that than to have the entire crackle hard as stone. Photo 18 – Watch with expectations!! 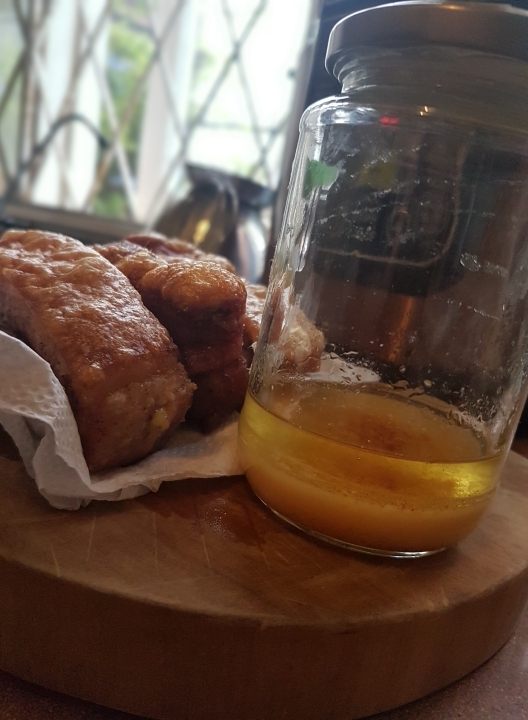 Photo 20 – Pour and store excess oil from the baking tray into a glass jar to be kept for future use – this is great for wantan mee!